Just in time for Halloween! These little two-bite cookies look impressive but are super easy to make. Your kids (and you!) will love them. 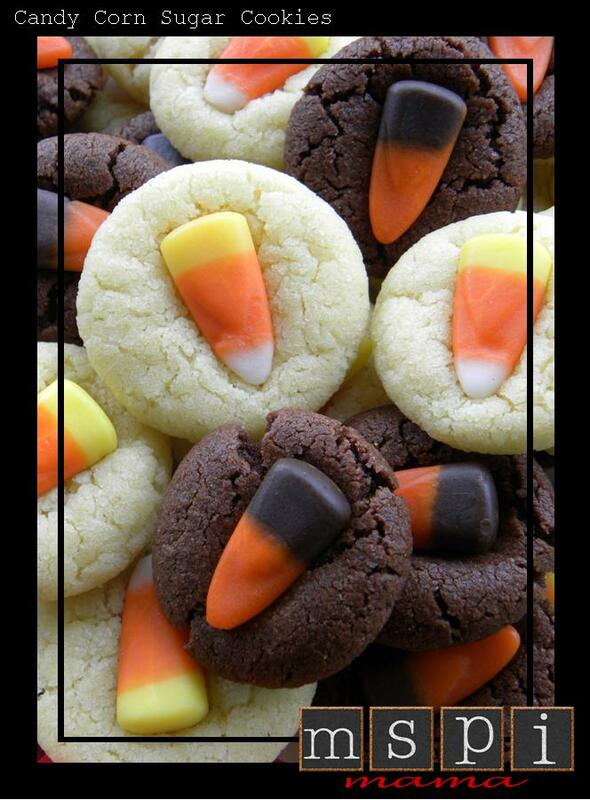 I made a batch for a Halloween party during Libby's gymnastics class, and they were a huge hit. Run out and pick up a bag of candy corn before they're all sold out! The original recipe calls for butter. I substituted half MSPI-friendly margarine and half butter-flavored shortening. I do that with cookies because I prefer the results and texture of the cookies, however, you can use all margarine or all shortening. And just a little FYI about candy corn, there's a chance for dairy cross-contamination on some brands of candy corn, so read labels carefully if that is a concern for you! Preheat oven to 350 degrees. Place margarine, shortening and sugar in a medium bowl; beat until combined. Beat in egg yolk, vanilla, baking powder and salt. Add flour, and mix until a dough forms. Using a teaspoon-sized measuring spoon, scoop out level teaspoons of dough, and roll into balls (chill dough briefly if it becomes too soft to handle). Place balls on baking sheets, 2 inches apart. Bake, rotating sheets halfway through, until edges are firm and cookies are dry to the touch (do not let cookies color), 10 to 12 minutes. Remove from oven; gently press a candy corn into center of each cookie (surface of cookies may crack slightly). Cool on sheets 1 minute; transfer to a rack to cool completely. Chocolate variation: Reduce the amount of flour given in the recipe to 1/2 cup. Add 1/4 cup unsweetened cocoa powder along with the flour in step 1, and proceed. Tip: I made a full batch of plain and a full batch of chocolate at the same time in separate bowls. That way I can get all the measuring out the way and keep my workspace a littler tidier.